David Catlin Consulting – Don’t Use Signs–Use Better Designs! When a nature center and all its components are well designed, they help you achieve your goals and objectives. When they aren’t, they sometimes get in the way of the work you are trying to achieve. Because so much of the work I do involves designing new nature centers or re-designing old ones, I am always alert for better ways to do it. One clue that an existing design isn’t working is signage—especially temporary signage. 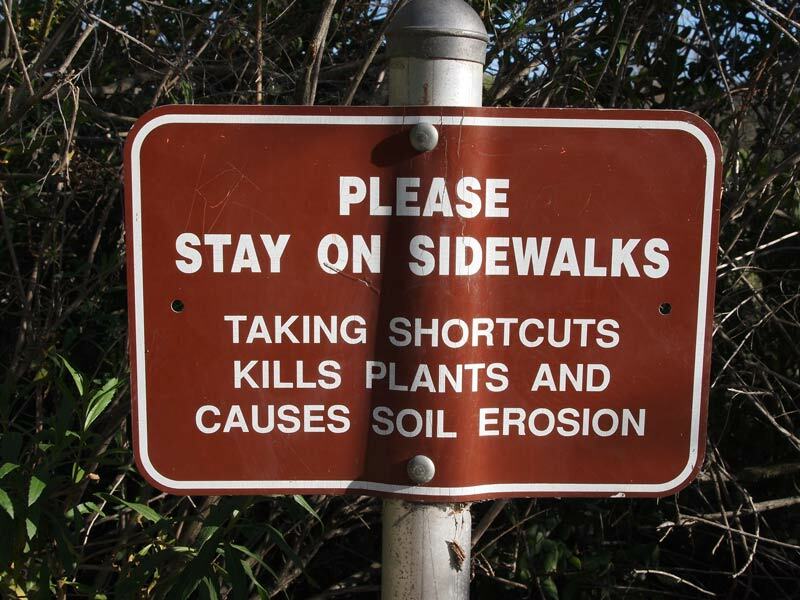 I always study signs at nature centers and similar facilities for the design failures they reveal. Take the sign above. 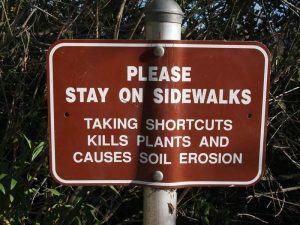 The overt message is that visitors should stay on the sidewalks. But the underlying message to me, as a designer, is that the sidewalks as they’ve been laid out don’t take visitors where they want to go. Otherwise, why would people leave them? That’s a design problem. And, while our first instinct in solving a design problem is often to put up a sign—it’s cheap, after all, and doesn’t usually require high-level approval—the reality is that signs are usually poor fixes for design issues. People often don’t read signs, and they frequently choose to ignore them when they do. Lately I’ve been working on a renovation of a 40-year-old nature center building for a client. One of the temporary signs I encountered there one morning was very enlightening. Taped to the front door facing visitors as they came up the walkway was a laminated computer printout that said, “Educational program in progress. Please return after 12:00 p.m.” Since the building was advertised as open to the public, I had to wonder: Why can’t they come in the building when a school program is underway? The reason, it turns out, is that the interior layout of the building and placement of the live animal exhibits inside creates such concentrated crowding and confusion that walk-in visitors and students can’t comfortably be in the space at the same time—even though there is plenty of room in the building for everybody. So pay special attention to the directional and temporary signage at the next center you visit (or even do a little inventory at your own center). Where are signs being asked to solve problems created by poor design? What design changes could be made to solve the problem? In the long run, you may avoid a lot of frustration (both yours and that of your visitors) by fixing the design, not the sign.